This topic discusses the basic structure of a WordprocessingML document and reviews important Open XML SDK classes that are used most often to create WordprocessingML documents. The basic document structure of a WordProcessingML document consists of the <document> and <body> elements, followed by one or more block level elements such as <p>, which represents a paragraph. A paragraph contains one or more <r> elements. The <r> stands for run, which is a region of text with a common set of properties, such as formatting. A run contains one or more <t> elements. The <t> element contains a range of text. The Open XML SDK 2.5 API provides strongly-typed classes in the DocumentFormat.OpenXML.WordprocessingML namespace that correspond to WordprocessingML elements. The following table lists some important WordprocessingML elements, the WordprocessingML document package part that the element corresponds to (where applicable) and the managed class that represents the element in the Open XML SDK 2.5 API. Main Document document Document The root element for the main document part. Comments comments Comments The root element for the comments part. Document Settings settings Settings The root element for the document settings part. Endnotes endnotes Endnotes The root element for the endnotes part. Footer ftr Footer The root element for the footer part. Footnotes footnotes Footnotes The root element for the footnotes part. 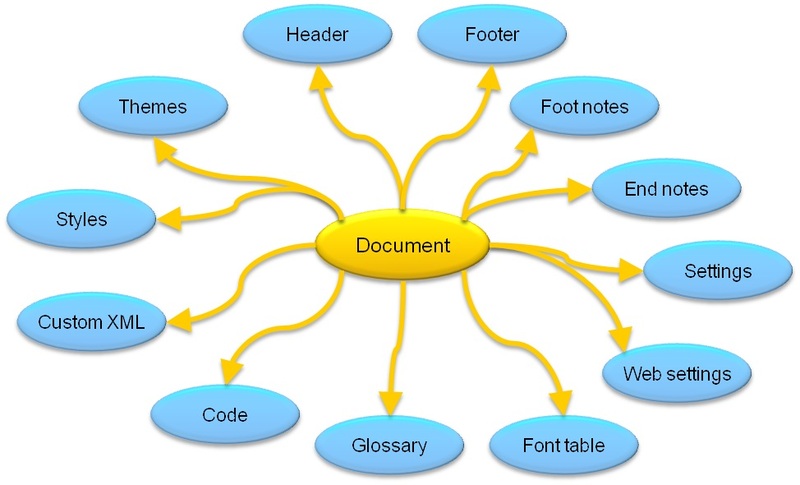 Glossary Document glossaryDocument GlossaryDocument The root element for the glossary document part. Header hdr Header The root element for the header part. Style Definitions styles Styles The root element for a Style Definitions part. Not all stories must be present in a valid WordprocessingML document. The simplest, valid WordprocessingML document only requires a single story—the main document story. In WordprocessingML, the main document story is represented by the main document part. At a minimum, to create a valid WordprocessingML document using code, add a main document part to the document. The following information from the ISO/IEC 29500 introduces the WordprocessingML elements required in the main document part in order to complete the minimum document scenario. document — The root element for a WordprocessingML's main document part, which defines the main document story. body — The container for the collection of block-level structures that comprise the main story. t — A range of text. The following code uses the Open XML SDK 2.5 to create a simple WordprocessingML document that contains the text "Hello, Word!" // Add a main document part. // Create the document structure and add some text. // String msg contains the text, "Hello, Word!" ' Add a main document part.
' Create the document structure and add some text.
' String msg contains the text, "Hello, Word!" After you run the Open XML SDK 2.5 code in the previous section to generate a document, you can explore the contents of the .zip package to view the WordprocessingML XML code. To view the .zip package, rename the extension on the minimum document from .docx to .zip. The .zip package contains the parts that make up the document. In this case, since the code created a minimal WordprocessingML document, there is only a single part—the main document part.The following figure shows the structure under the word folder of the .zip package for a minimum document that contains a single line of text.Art placeholderThe document.xml file corresponds to the WordprocessingML main document part and it is this part that contains the content of the main body of the document. The following XML code is generated in the document.xml file when you run the Open XML SDK 2.5 code in the previous section. A typical document will not be a blank, minimum document. A typical document might contain comments, headers, footers, footnotes, and endnotes, for example. Each of these additional parts is contained within the zip package of the wordprocessing document. The following figure shows many of the parts that you would find in a typical document.